You never know when the power will go out in your home, leaving you unable to turn on any lights, open your refrigerator, use any appliances like televisions and computers, enjoy the a/c or heat, and more. This sounds pretty dreadful, right? It can also be dangerous, so many homeowners purchase generators to use in cases like this, so they can have the power they need during these times. Generators have certain useful lifespans, much like other similar machines. They typically last from 10,000 to 30,000 hours, which can be used up faster than you think if you don’t get it routinely checked for use and possible damage. 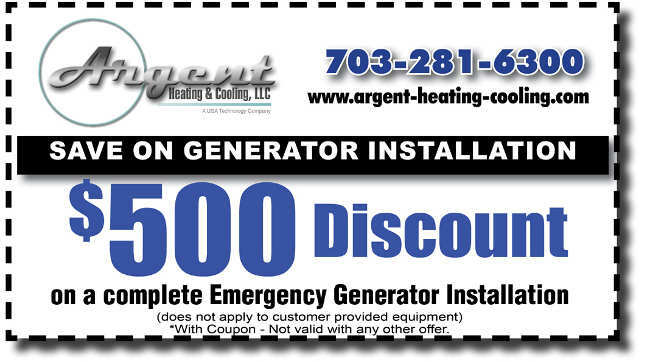 Argent Heating and Cooling offers generator maintenance in Northern Virginia to ensure that yours is up to date to keep your home running. The year can get busy with your family getting involved with school, work, extracurriculars, and other activities, so summer is a great time to get big tasks checked off your to do list. Since generators are complex machines, it might take even a professional substantial time to check and do routine maintenance, making summer the best time to get it done. You will have more free time when the kids are at home, friends’ houses, or summer camps to call Argent Heating and Cooling to come get the job done. When you think of summer weather, you think hot, humid, and miserable, but there is a lot more to it. The summer weather can be unpredictable, bringing things such as thunderstorms, heavy winds, heat waves, and more. With these unpredictable wind and thunderstorms likely to occur, your home’s power may fail. Whether a tree fell on a power line or the wind caused the power lines to snag, you will need another way to power your home. You will never know how lengthy the outage will be, so make sure your generator is up to date and ready for action during this extreme summer weather. The winter is the time of year you may need your generator the most. If your power happens to go out and you are left with no heat for a while, you will be both miserable and dangerous. Having a generator that is maintained and ensured to work during this cold and dreary season will prevent that. Generators are complex machines, like cars. You routinely take in your car for checks to make sure it is still running smoothly and has no problems. Although generators are not the exact same as cars, they also produce power and need to get regularly checked like your vehicle for the same reasons, so have a professional at Argent Heating and Cooling do it for you. Contact us today to get a discount on our generator maintenance plan, and view our specials!